When the new Classic swatchbooks came out earlier this year, Neenah introduced two new finishes: Woodgrain and Techweave. We immediately swooned over the woodgrain before even a glimpse. Just the name sent us into the atmosphere. And, while we are enamored with it, it’s the Techweave that has taken us hook, line and sinker. This unique finely patterned, attention-grabbing finish can enhance a project in so many ways. Its pattern can look modern. It can look vintage. It can read as super corporate but it is still conveys itself as warm and inviting. Because of this, we’ve seen it used on a wide variety of projects successfully. It calls attention to whatever is printed on it. 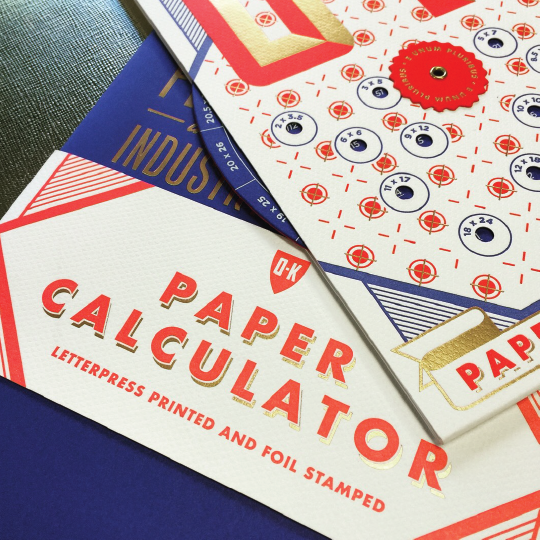 Because of this, we thought it was the perfect choice for our own re-interpreted O-K Paper Calculator. Have you seen it? Our paper calculator gives a nod to early volvelle construction and is assembled using paper only. Known for their rigorous alignment and reliable precision, volvelles are devices consisting of rotating circles and die-cut windows. These devices have been used since the Middle Ages to measure, record, and predict everything from time and space, to paper cut sheet calculations. The impact of the letterpress impression onto the Techweave finish is gorgeous. The heat and pressure of the stamping smoothes the pattern of the paper’s texture. 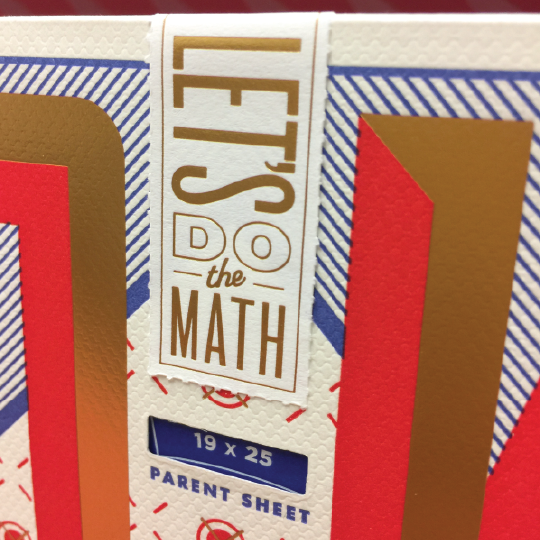 The shiny, gold foil does the same with crisp, clean edges. This volvelle itself is constructed with Techweave, 165 DTC wrapped around the custom duplexed wheel joined together with a brass grommet. The intricate die-cut windows reveal the Classic Crest smooth Cobalt duplexed to smooth, Imperial Red. The 165 DTC held up to multiple passes through the press of foil and ink. And we added in a foil stamped Classic Crest label with perfed edges to give it a further vintage feel. Not only did this project get us noticed. Its won multiple awards including a DSVC Bronze award and a "Best of Division" award from the Printing Industries of America. We're stocking the Techweave finish in several Neenah whites, Cool Gray to the Epic Black. Grab a copy of our compact, quick reference selection tool "The Power of Premium" to browse Techweave and see it action. Even more Techweave finish colors are available for us to order for you from the mill including a Epic Black/Solar White Duplex. Squeal. Would you like your own O-K Calculator? Reach out to your Olmsted-Kirk paper representative. We still have a limited supply to share. In the meantime, spec this spectacular finish. It will make your project get noticed and your message stand out.